Trading opportunities on the currency pair: The Kiwi dollar came under intense pressure following New Zealand’s parliamentary elections. 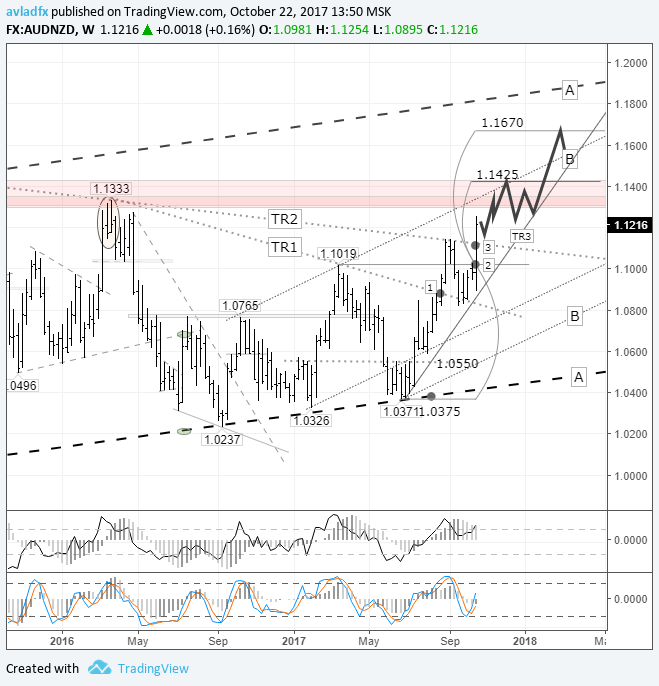 The Aussie is expected to continue strengthening to reach 1.1425 (61.8% of the downwards wave from 1.1019 to 1.0371) by the beginning of December this year. After a month of consolidating at the beginning of 2018, 1.1425 level is likely to be broken, with subsequent growth to 1.1670 (100% of the downwards wave from 1.1019 to 1.0371). This forecast will be cancelled if the price breaks through the TR3 trend line. The previous idea on the AUDNZD pair was published on the 24th of July. At press time, the Aussie was trading at 1.0612 against the Kiwi. In the review, I was thinking that the pin bar model wasn’t working out and that after the dropping to 1.0550; the price would recover to 1.0868. In the end, the rate dropped to 1.0591 before jumping to 1.1144. In September, buyers successfully broke through the TR1 trend line at 1.0875 (point 1 on the chart). Growth slowed down at the TR2 trend line. After an unsuccessful attempt at breaking through 1.1140, buyers receded to 1.0824 in order to try and build up some speed. Last week, the price broke through the TR2 trend line at point 3. The New Zealand dollar significantly weakened against a lot of the major currencies following the parliamentary elections. It slid following the formation of a new coalition government. Investors are worried about political uncertainty, which has weighed down on the New Zealand dollar. The AUDNZD pair has been in a sideways trend since September 2014. There are about 900 pips separating the lower boundary of the A-A channel and 1.1429 level (high from June 2015). The weekly technical picture suggests a further rise for the Aussie against the Kiwi. According to the forecast, the Aussie will rise to 1.1425 (61.8% of the downwards wave from 1.1019 to 1.0371) by the beginning of December this year. After a month of consolidating at the beginning of 2018, a breakout of 1.1425 is likely, followed by further growth to 1.1670 (100% of the downwards wave from 1.1019 to 1.0371). This forecast will be cancelled if the TR3 line gets broken through.